"The IROP grant provided funding that allowed me to stay in Sweden long enough to take manual samples to compare with the acoustic data." "You might say I helped work out the kinks with last year's fieldwork so things will go more smoothly for the undergraduates this summer." "UNH has provided me with so much and so many research opportunities, I guess I just don't want to leave." WHEN JACKI AMANTE GRADUATES from UNH in May, she’ll do so knowing she had a hand in potentially helping solve a big piece of the climate change puzzle: how much of the powerful greenhouse gas methane is emitted to the atmosphere through the process of ebullition – bubbling up to the atmosphere through peat (organic soil) and water. 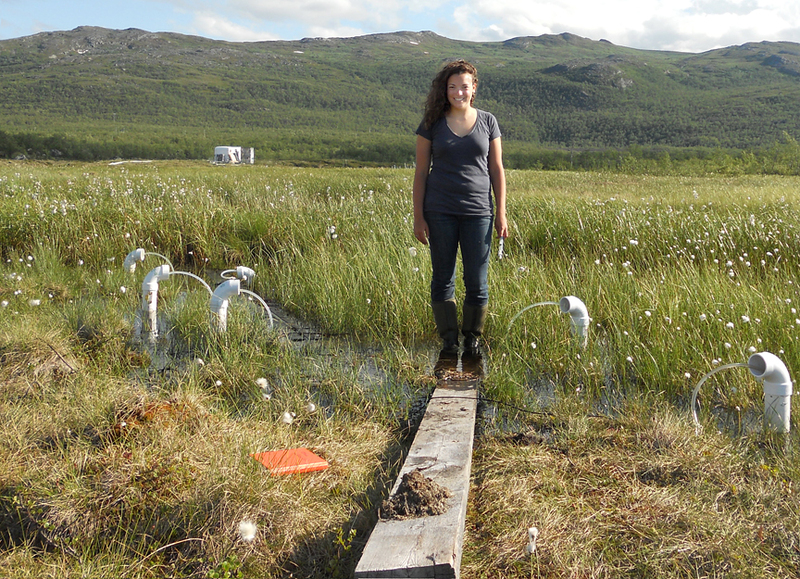 Senior Jacki Amante extracts methane gas collected by unique, UNH-built sensors deployed in a permafrost region of northern Sweden. Photo by Kaitlyn Steele, UNH Graduate Student. Wetlands are the planet's largest natural source of methane, and ebullition is perhaps a dominant pathway for its release. But measuring the bubbling process is so challenging that its estimated contribution to the global budget runs the gamut from zero to 60 percent as gauged by just a handful of field studies. For two years, Amante has worked with Earth Systems Research Center (ESRC) researchers Ruth Varner and Michael Palace and former master's student Jillian Lennartz to help build and test an instrument that can autonomously measure individual methane bubbles by sound in an effort to, eventually, help gauge the global methane budget. (See "Ebullient Science" in the Winter 2011 issue of Spheres.) Amante has been on the ebullition project from the start and it is the basis of her senior thesis. She will also present a poster on the work at the upcoming Undergraduate Research Conference (URC) in April. 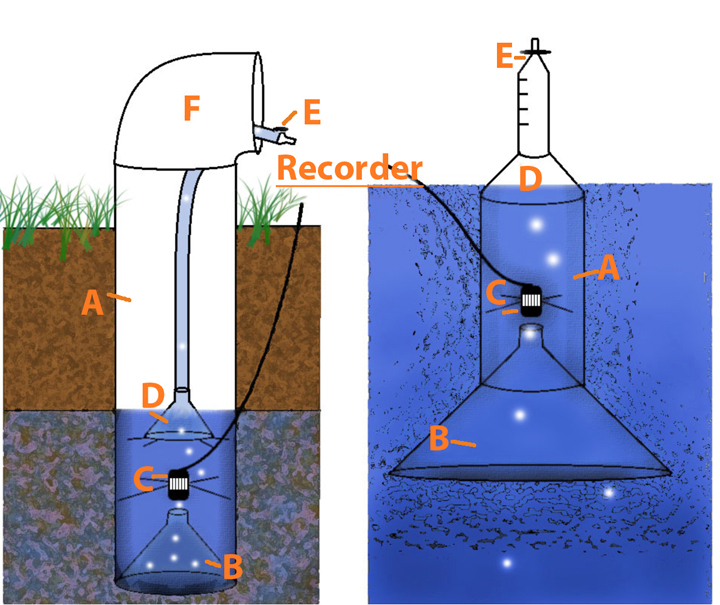 The unique UNH-built sensors are comprised of a side-hinged PVC pipe containing two, small offset funnels – one containing an underwater microphone or hydrophone that records the amplitude and frequency of individual methane bubbles, and one off to the other side and higher up that captures the rising bubble after it hits the hydrophone and then sends it up a tube into a gas trap (see figure below). 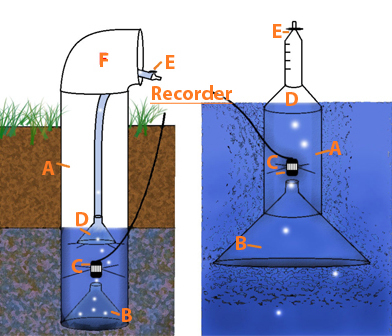 This figure shows the workings of the acoustic bubble sensor design as deployed in peat (left) and underwater (right). B - the lower bubble funnel that makes the initial capture. C - hydrophone recorder held in place by studs. D - upper bubble funnel that channels the bubble to a gas trap. E - gas trap with syringe terminal. Everyday in Stordalen, Amante worked from "dawn to dusk" in the Arctic's 24-hour daylight collecting samples from the gas traps by inserting a syringe to extract the methane. 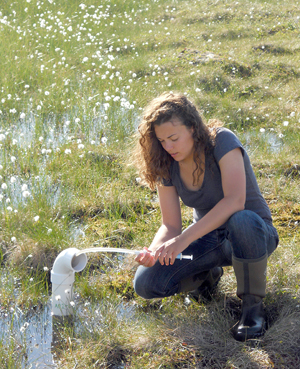 She then ran samples through a gas chromatograph at the Abisko lab to measure the concentration of methane bubbles. Later, the manual data is compared to the data recorded by the hydrophone to see if the two jibe. Explains Amante, "The IROP grant provided funding that allowed me to stay in Sweden long enough to take manual samples to compare with the acoustic data. We're now looking at all the recordings, the acoustic data, to see if that matches the manual data I gathered. So far it's looking pretty good, meaning it's following the same trend lines – what I recorded manually is matching what the acoustic data sensors recorded." In other words, it appears the seminal system for measuring methane ebullition remotely and autonomously will prove to be successful. If so, the zero-to-60-percent error bar for the global methane budget could soon be narrowed. 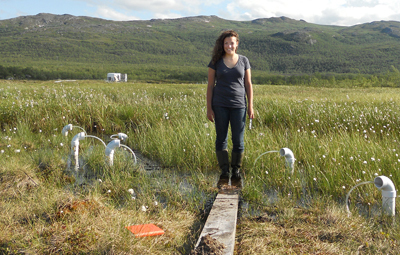 Last summer's successful preparatory fieldwork helped cement funding from the National Science Foundation for The Northern Ecosystems Research for Undergraduates (NERU) program, which will expand Varner's work in Sweden and involve nine undergraduates from U.S. universities, including two from UNH. The students will split their time between UNH and Abisko. The NERU program focuses on the impacts of climate change on ecosystems in northern Sweden and one part of the work will be installing more of the ebullition sensors now that the technology has been proven. Notes Amante, "You might say I helped work out the kinks with last year's fieldwork so things will go more smoothly for the undergraduates this summer." Amante extracts trapped gas from one of the senors deployed to measure underwater ebullition of methane bubbles. As for her future education and research endeavors, Amante hopes she will be able to remain at UNH and retain Varner as her advisor as she pursues a master's degree in the field of environmental toxicology. To that end, she has applied to both the National Science Foundation and Environmental Protection Agency for a fellowship that would provide tuition and stipend funds. During her four years at UNH, Amante has worked in a number of labs doing a variety of research but they have all involved water and wetland ecosystems. "After having had all those experiences I've now been able to narrow down where I finally want to focus the rest of my career, and that's in environmental toxicology," Amante says. Specifically, she hopes to focus her master's work on helping determine why the population of loons on Squam Lake in New Hampshire's White Mountains has declined by 50 percent and if unusually high levels of polybrominated diphenyl ethers (PBDEs) – flame retardants used in plastics, foams, and fabrics – could be the cause. "Loons are high trophic-level feeders and eat mollusks, fish, insects, weeds, amphibians, etcetera," Amante says. "It's thought that PBDEs are bioaccumulating up the food web and making it harder for loons to reproduce or survive – but it's not known exactly where in the web it might be inhibiting the loons." So Amante's work would focus on figuring out what the majority of the loons' diet is by using stable isotopes of carbon and nitrogen. Because of differences in the pathways of each isotope, comparing the two isotopic ratios will allow for a holistic view of what the loon diet is. When the majority of the loon diet is determined, that specific trophic level can then be tested for PBDEs. Amante, surrounded by a series of sensors in the Stordalen mire complex some 124 miles north of the Arctic Circle in northern Sweden. 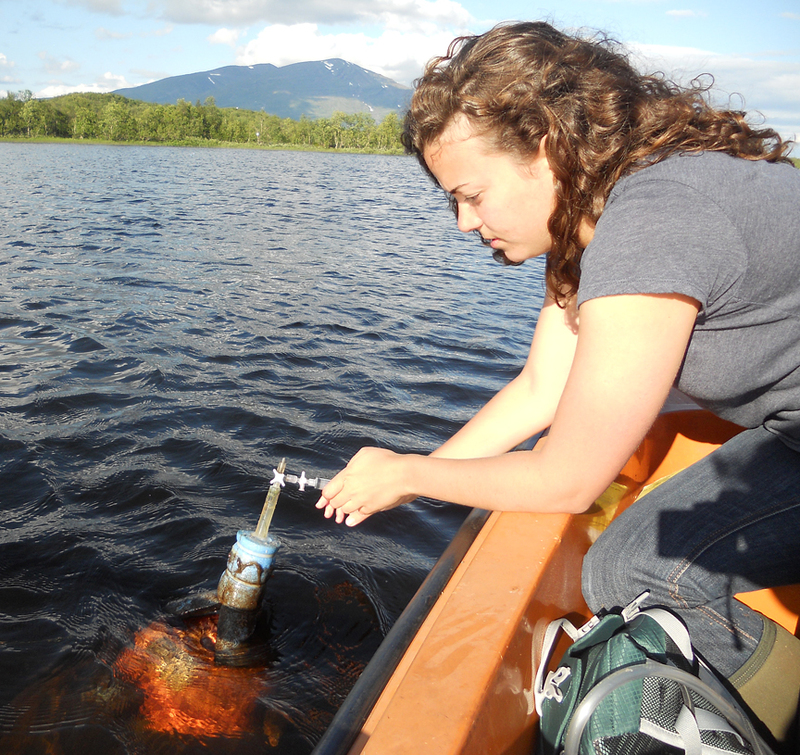 "Hopefully I'll be able to narrow down what the loons are eating the most of in Squam Lake and then track it backwards and do more expensive testing to determine where the chemical problem enters into the equation. And I'll use Lake Winnipesaukee, Lake Umbagog and maybe Lake Massabesic as reference lakes because they all have similar use but don't show the same high chemical levels." Amante notes that the project represents an interdisciplinary collaboration between the UNH Center for Freshwater Biology, the ESRC, the UNH Stable Isotope Laboratory, and the Loon Preservation Committee in Moultonborough, NH, and has the potential to link the fields of geochemistry with biological systems in a unique way. And the master's work would, Amante asserts, be a perfect blend of both her personal and research interests. "I love birds and I'd like now to blend in an animal side to the hydrology and chemistry. I've enjoyed every minute of my work with Dr. Varner and because her background is in hydrology and her research field is biogeochemistry, she could remain as my master's advisor," Amante says adding, "UNH has provided me with so much and so many research opportunities, I guess I just don't want to leave."